The Damned will come out November 15, 2015. A cover reveal and additional teasers will be posted here in the upcoming weeks and months! Until then, enjoy! Wakefulness came in a short, shuddering burst. Andre let out a low moan. He was empty, absolutely empty. She’s gone. Oh, God, she’s gone. He bellowed out his anguish. The vampires that had pinned him to the ground woke at his cry, their hands reflexively tightening on him. “Damn you all, let me go!” He could feel cool wetness on his cheeks where fresh, bloody tears replaced old ones. “We can’t,” Vicca said. Her voice sounded like an apology. He didn’t want an apology; he wanted away. His blackened heart was shredded to pieces. He couldn’t say how fast the time passed. It could’ve been minutes since he awoke. It could’ve been hours. A shape blurred into the room, stopping near his feet. “Sire,” the vampire said, breathless. Andre ignored the man. “Kill me! I beg of you,” he pleaded to those that held him down. He never used to plead, but now—God, what he wouldn’t do to end this torment. Hell had to be kinder than this. Andre thrashed. “Let. Me. Go!” He felt his hair ruffle, but that was it. He could no longer conjure up his power. His coven had already started to drain him of blood. They would have to weaken him until he was a desiccated husk. Then they’d chain him inside a coffin and bury it so far down that the earth would convince him he was really a dead thing. Then perhaps he could sleep and they could live. It wasn’t a good enough option. He needed death. That was the only way he could be near enough to her. You can add The Damned to your Goodread’s To-Read list, here! It’s that time again where I have to post the playlist that inspired the story—or is it the story that inspired the playlist? Whatever. Point is, I’ve got some cool tracks (not biased) for Reaping Angels, which is a part of the Beneath the Cape anthology. I hope you hear Angel’s sassy attitude in them—that’s what I love about this particular playlist. It’s got ’tude. Also, as a side note, I now have several of you pushing for teasers for The Damned … and The Queen of Traitors … and Rhapsodic, my adult paranormal romance (rawr!). I promise to have more updates and teasers on these in the future (especially on that last one because I know you’re scratching your head and wondering what the heck that book’s all about). But… something that always works to pull my attention to a particular project is when you show interest. So posting reviews on Amazon and Goodreads for these books and the others in the series is a great way to get my attention, as is contacting me (laurathalassa.author@gmail.com) or reaching out to me on Goodreads or Facebook. Okay, ever onwards! Enjoy the playlist! The title says it all! 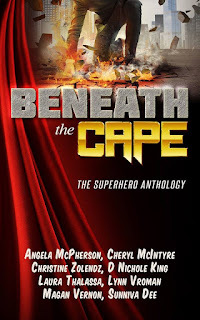 Beneath the Cape: The Superhero Anthology is now available on Amazon. Click here to check it out! Read on for a description of the anthology! Only available July 1st - October 1st. Save the world and protect mankind. Kelly Black can’t believe she’ll be the new teaching assistant to Alexander Masters. The Alexander Masters—the head of the entire biology department. As soon as they begin to work together sparks fly and danger swirls around them. Check out Beneath the Cape here on Amazon!